When done right, smoked brisket is one of the most succulent and tender dishes you can create in grilling season. Do it wrong, and you’ll spend hours just to end up with a beef-flavored piece of shoe leather. The brisket is the muscle that covers a cow’s chest, and it’s famously difficult to cook well. The relatively low temperatures and slow-cooking time in an electric smoker are perfectly suited for turning this culinary challenge into the star of your summer menu. Flexibility: The easier it is to bend your brisket, the less connective tissue it has inside. That makes for a more tender cut of meat. Choose the cut of meat that bends the easiest. Size and weight: The size of your brisket depends on the size of your smoker, how many people you’re feeding and how much beef you can afford. 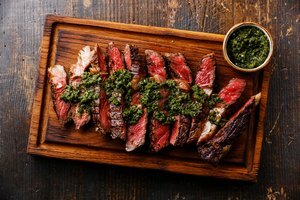 Marbling: The marbling is the fat that runs between all the lean pieces of meat. The higher quality brisket will be the one with the most marbling. The point and the flat: These code words refer to two sides of the brisket. The flat is the lean end of the brisket and the point is the fattier part. Look for a piece with a thicker flat to ensure that both ends will cook evenly. Trimming your brisket is key to the texture in your finished dish. The amount of fat you leave will determine how the beef will cook. 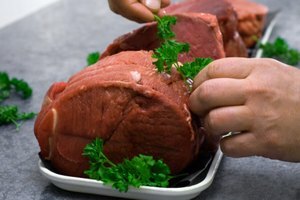 If you take off too much fat during the trimming process, there won’t be enough moisture left for the beef to absorb, leaving it dry and tasteless. Leave too much, though, and the layer of fat will prevent the smoky flavor from permeating the meat, and you’ll end up with a brisket that just tastes greasy. The ideal thickness is about 1/4 inch of fat on all surfaces. Refrigerate the brisket about four hours, or until the meat is cold all the way through. This makes it easier to cut through the fat. Use a sharp boning knife for the trimming process. Start by trimming the sides, removing any loose pieces of fat you find; then work toward the ends of the meat. There’s a thick layer of fat called the deckle that’s situated between the point and the flat. You need to remove this, as it won’t melt during smoking. Remove the fat from all over the brisket, leaving an even layer throughout. Season your trimmed brisket with a dry rub. Purchase premade dry rub mixtures or create one yourself. A typical dry rub for brisket recipe includes ingredients like paprika, garlic powder, red pepper flakes, brown sugar or chili powder. Or, if you’re a purist, stick with the traditional sea salt and black pepper to create a beautiful piece of smoked beef. As the name implies, a dry rub mixture is meant to be rubbed onto the surface of the meat. Rub a generous amount on the surface, especially on the leaner areas. 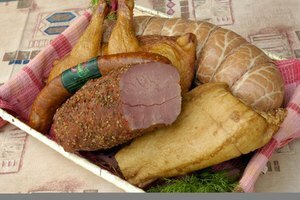 Wrap the treated meat in foil and allow it to rest in the refrigerator. It’s best to leave the meat in overnight, but take a minimum of 4 hours to allow the flavors to begin melding with the meat. Turn on your electric smoker and preheat it to 225 degrees F. Once the interior is evenly heated, put your chosen wood chips in the smoker box. The choice of wood is hotly debated in some circles, but in general, all types give a brisket that smoky flavor. Different woods impart only small differences in taste. That said, pitmasters generally agree that wood that provides medium-strength smoke, which includes hickory, oak, maple and pecan, is good for beef. What about mesquite, that legendary smoking ingredient? Use it as a condiment, as if it were chili peppers. A little goes a long way. Take the wrapped brisket out of the refrigerator and allow it to sit at room temperature for at least an hour. Once the meat has lost its chill, remove the foil and place the brisket in the smoker, fat-side up. As the beef stays in the heat of the smoker, that fat layer will melt, pouring over the meat to help keep it from drying out. If you have a smoker with the heat source underneath the meat, place it fat-side down as a protective layer. Keep the meat moist by putting a pan of water on top of the smoking device. The steam will keep the air inside the smoker moister, allowing the smoke to better penetrate the brisket. Place a drip pan underneath the meat to reduce the chance of flare-ups; then close the smoker lid securely. The first three hours of smoking are crucial, as that’s when your meat will absorb most of the smoky flavor. After three hours are up, the next step is to spray the meat every half-hour to an hour to keep it moist and begin to develop that tasty, dark crust on the surface. Spray ingredients vary; you can use vinegar, apple juice, beef stock or plain water, depending on your taste buds. Keep spraying and checking the meat every hour or so until your brisket has reached an internal temperature of 195 degrees F. The time that this occurs varies from brisket to brisket, depending on the thickness and size of your meat. As a general rule, you can count on your brisket taking about an hour for every pound to be fully cooked, with a minimum of five hours to a maximum of 12 hours or longer. 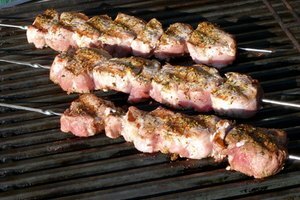 One step that novice smokers often skip is the key practice of allowing the meat to rest after being pulled from the smoker. Yes, it smells delicious, and it’s tempting to dig in right away. But resting it allows all those tasty juices to distribute inside the meat. Cover your brisket with some foil and allow it to sit until it reaches an internal temperature of 170 degrees F before you allow anyone to slice off that important first end piece. Once the meat has rested, slice it right away and eat it. Use a large serrated knife, one with a long blade, so you can take off slices without shredding the meat. Cut the slices about the thickness of a chopstick. If dinner is delayed and you can’t eat it right away, wrap the brisket uncut to keep in all that juicy moisture. Bon Appetit: Which Type of Wood Should You Use for Smoking Meat? Chowhound: What Is the Difference Between Brisket and Texas Brisket?